The Wishbone Chair, also known as the Y-Chair or the CH24, is famous for its unique design and iconic features. It is a prime example of ‘Danish Modern’. While fulfilling the demands of comfort and stability, the Wishbone Chair retains its distinct look which stems from the blending of minimalism and organic softness. It follows the design philosophy of Organic Functionality style – a modernist school which has largely influenced mid-century Danish design. As one of Hans Wegner’s most famous designs, the Y-Chair exemplifies his amazing talent for working with wood, as well as his deep respect for nature. With its clean and simple lines – which hide a rather complex and, at the time, cutting edge joinery-, this timeless classic of Danish furniture is as popular today as it was more than half a century ago when it was first released. The continuous demand for this particular Hans Wegner Chair ensures that this iconic piece is still in production to this day. However, one should keep in mind that purchasing the original might be a rather costly affair, so if you are on a limited budget, buying this designer chair replica might be the better option. This Hans Wegner chair retains its popularity today thanks to a thoroughly thought out design which makes it simple, functional, and discreet. In addition, style and elegance are elements which are clearly present. Without any unnecessary decoration, the Y-Chair’s unique expression stems from its fluid, organic and recognizable shapes. The combination of that rustic look, emboldened by its wooden frame and hand-woven paper cord brings that Scandinavian charm into any home. Designed in 1949, Wegner’s Wishbone Chair is the last and arguably the most distinct addition to a series inspired by portraits of Danish merchants sitting in traditional Chinese Ming Dynasty chairs. Produced by Carl Hansen & Søn since 1950, the CH24 went on to become Wegner’s most successful design and the jewel of his long and productive career. Inspired by history, yet undeniably modern, the Y-Chair was seen by many as a giant leap in furniture design. It exemplifies the designer’s masterful knowledge of joints, shapes, and materials.Cabinet-maker Johannes Hansen has been credited with bringing to life this remarkable Wegner piece and introducing modern design to the Danish public. The back legs of Wegner’s Wishbone chair are steam-bent into a curve that joins the circular top rail. This is combined with the arms into a single piece. The characteristic Y-shaped back, from which this chair gets its name, provides comfortable support while giving stability to the top rail. Innovative usage of these rather complex joints provides Wegner’s chair with stability and robustness, without increasing the weight. While the choice of shapes and materials ensure that the Y-Chair retains functionality and comfort as its core characteristics, it also keeps a distinct and modern look. Hans Wegner was born on 2nd April 1914 in Tønder, Denmark. At a young age, he started working as an apprentice to master cabinetmaker H. F. Stahlberg where he soon discovered he had an interest and natural knack for working with wood. Wegner would go on to develop an affinity towards the material which would effectively define his entire career. Finishing his apprenticeship at 17 he remained in the workshop for another three years before joining the army. Afterwards, he went to a technical college followed by studies at the Danish School of Arts and Crafts in Copenhagen. After finishing his studies in 1940, Wegner started working at Erik Møller and Arne Jacobsen’s design studio where one his first assignments was to assist in designing furniture for the new town hall in Aarhus. During the war, he worked with Børge Mogensen at FDB Furniture. At FDB Furniture, Wegner helped create FDB’s low-cost quality furniture which was an important part of the functionalistic ideology behind the Danish Modern. Along with other big names in Danish design, Hans J. Wegner’s work is often credited for changing the general public’s view of furniture in the 1950s and 1960s. Unlike most of the other designers at the time, this designer was not interested in architecture. Instead, he devoted his entire career to furniture design, especially chairs. During the decades, Wegner designed over 500 chairs and a large number of different furniture elements pieces. However, he has earned himself the title: “The Master of the Chair”. When talking about Wegner’s work, one must mention his deep respect for wood as a material and his amazing talent and skill in using this material in his designs. During his apprenticeship at Stahlberg’s workshop to the Carpenter’s Guild Furniture Exhibits he frequented, Hans Wegner was amazed by the possibilities of combining workmanship and design. The crucial role carpentry played in the shaping of his further career is what makes him unique among mid-century Danish furniture designers. Since he had little interest in modern synthetic materials such as plastic, and instead preferred to design his furniture with natural materials in mind, he placed most of his focus on crafting and re-crafting his creations out of wood. In addition, Wegner found great inspiration in the Chinese chairs from the Ming era which strongly influenced his most successful series of designer chairs – with the Wishbone Chair as its crown achievement. Staying true to both the original design and the philosophy behind it, Wegner’s chair replicas are produced in several types of wood and with different finishes which strongly influence the texture and the visibility of the wood grain. If you are looking for a more natural look, you may choose to buy the CH24 replica in oak or ash, since the wooden texture will be visible through the paint. 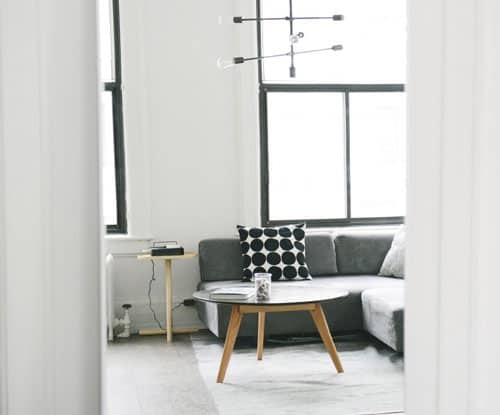 On the other hand, if you want to keep your room in purely black or white tones, you might choose painted beech which will minimize the visibility of the wood grain. 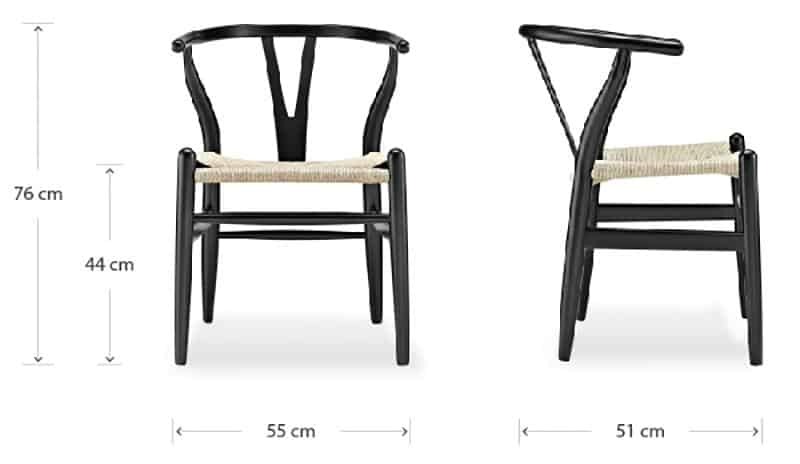 The dimensions of the chair are on the right. 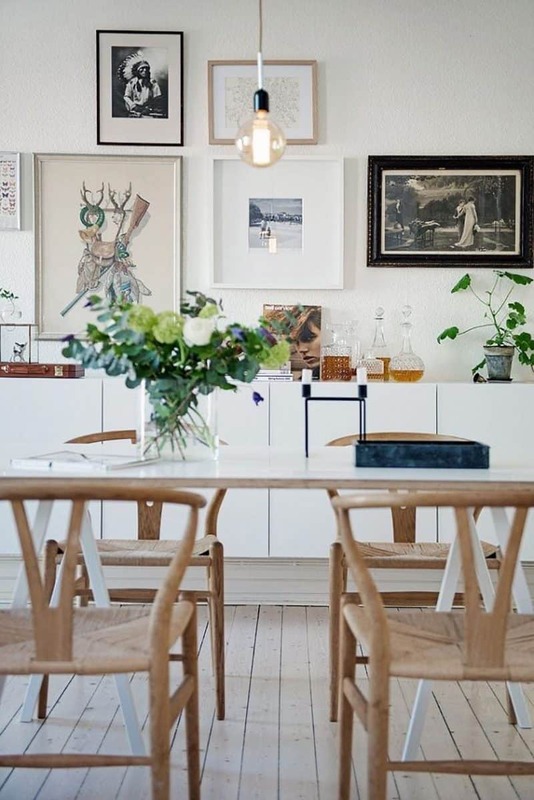 *It’s important to note that the height of the chair has been slightly modified for mass production purposes since the original release of Wegner’s Wishbone Chair. The increase in average height has been sighted as one of the reasons for this change.